View UHD-resolution HDMI signals with the Ikan DH7 Monitor. Featuring a 1920x1200 WUXGA IPS panel for accurate color and wide viewing angles, the 4K-compatible HDMI connections can accept and loop-output 4K HDMI signals without requiring extra downscaling hardware. Because the DH7 can work with 4K signals, which have greater representation of fine details and edges, focus assist functions, such as focus peaking and punch-in through 1:1 pixel mapping, are enhanced. The thin profile of the monitor as well as 1/4"-20 threads on all sides, make it easy to integrate into your DSLR or mirrorless camera setup. A convenient headphone output allows for audio monitoring straight from the camera's HDMI signal. The monitor includes two swappable battery plates: one for Canon LP-E6-type batteries and one for Sony L-type batteries. Box Dimensions (LxWxH) 14.6 x 7.9 x 2.95"
DH7 7" Full HD HDMI Monitor with 4K Signal Support is rated 4.1 out of 5 by 48. Rated 3 out of 5 by dan g. from Firmware upgrade needed Out of the box this has a great picture quality. However it didn't playback 60Hz resulting in useless playback for high speed work. Customer service was good in getting me a firmware upgrade to fix the problem. However this shouldn't have shipped this way. Also sunshade design is cumbersome. Rated 5 out of 5 by Robert G. from Awesome! I have a Sony FS7 4K camera and my Lilliput monitor doesn't match with it, but I just bought this Ikan monitor and it does really makes the difference, it's 4K is awesome! And it does support any format wish to record with the Sony FS7. Rated 5 out of 5 by Allin C. from great value monitor I needed a monitor as a focus aid and this monitor was perfect for me. It's lightweight and has peaking and zoom, both of which can be used at the same time. 2 customizable buttons allow for features to be turned on and off quickly. Picture quality is good but if you need exact color accuracy, I can't say if this is great at that or not. Again, I use this as a focus aid so it color accuracy doesn't matter to me much, but I don't notice anything wrong with the picture quality or color. Definitely going to pick up another one of these. It comes with a hood but no batteries or case. Rated 5 out of 5 by ANA MARIA M. from Great on camera monitor for a good price! I have waited for a good monitor to come on the market that is at least 7 inch, full HD resolution or better for a good price. I really believe Ikan DH7 is that monitor. Great quality, well build, it comes with Sony and Canon battery plates that gives you options depending on the project or how long you need the actual monitor to last. I've tried both and it drained the Canon LP-E6 batteries pretty fast , with Sony is quite ok, but adds some extra weight. Sharp and nice, with audio meters, peaking, false color etc, easy to navigate menu. I've also tried the monitor with 2 cameras: Canon C100 Mark1 and Nikon D810, the monitor is great for both with a few differences: 1080i signal coming out of HDMI on C100(I was hoping 1080P, maybe I did something with camera setting), 1080P from D810(there's an option for that in the camera menu), the HDMI for Canon C100 is full to full, for Nikon D810 is full to mini connection, they are not provided in the box. White balance preset for tungsten light is missing, manual is available as alternative. Overall I'm happy with my purchase! Rated 5 out of 5 by Ross from Very Impressed! At first I was reluctant to purchase the ikan DH7 because of the price, but I'm happy I did! My wife has always told me settling for some thing less because of price always ends up costing more in the long run. and she's been right. This monitor has such a clean crisp display when paired with my Canon DSLR's and my Canon XA20. Non of which are 4k but the monitor makes the images look like they are! If your a professional and quality tools of the trade matter to you I highly recommend the ikan DH7. Rated 5 out of 5 by Ricky from Amazing, Affordable and Reliable 4K Monitor I was so surprised to see such a high quality and light weight monitor at a fair price! It supports 4K Signal, Focus peaking Monochromatic, False Color, and more! The quality of the display is almost perfect, it displays a pretty close representation of your dslr display. However, a few adjustments of the RGB colors in the display settings could get it closer to perfect! My only gripe with the display is the brightness and slightly backlight bleeding in the corners. The brightness is pretty dim compared to my liliput 7 monitor at about 500nit brightness. Overall this is an amazing crystal clear monitor especially for 4K cameras! It super light weight, offers great input support and comes with TWO battery plates (Sony & Canon) Im using the SonyNP-F970 which last more than 6 hours easily. It also works flawlessly with 1080P signal! Rated 5 out of 5 by Studio L Media from ADD TO CART Picture quality and color rendering are excellent. Lightweight and easy to use. Even at this price point ikan didn't leave off a lot of features. Can't beat it for the money. Rated 4 out of 5 by Steve from Extremely useful for monitoring & focus pulling I’ve been used the Ikan DH7 for the last year on my various RED DSMC2 cameras. This is a greta monitor for focus pulling, composition, etc. Took a little time to work out the correct aspect ratio of the screen to get working correct with the RED but has served me on numerous productions as a secondary monitor. This does connect via HDMI so the cable management was a challenge, but for use to price, I would recommend the monitor to anyone. My only issue was the color representation between this and the RED. No matter what I tried, i couldn’t get this to match the RED LCD in terms of look on camera, so I haven’t used it in that respect. But for focus pulling, peaking, etc - its worked without faults. Does this monitor support color focus peaking or just in monochrome mode? Hi Lam,From what I can tell just Monochrome. Nice monitor though, well made and great image. it says it has adjustable upper clip guides but I have yet to figure out how to set them. Any clue? Go to the Menu&gt;Function Set-Up&gt;Clip Guides. If you're shooting at 120fps with the a7s II will this monitor still function or does it lose signal? This monitor accepts signals up to 60fps in HD and 30fps in UHD. It will not be able to view a 120fps signal. Such a frame rate is really going to be limited to viewing just on the camera's monitor in most cases. Can the battery be charged through the DC Input of the monitor? We cannot find any information that it can so we have the opinion the answer is no. Does this monitor show show waveform or color parade? This monitor has: Histogram &amp; Audio Level Meters, Peaking, False Color, Clip Guides, &amp; Pixel to Pixel but sorry no waveform or color parade. The most affordable ikan with waveform and color parade is the ikan D7w 7 3G-SDI/HDMI Field Monitor w/Waveform &amp; Sony L Batt Plate. If you need Canon LP-E6, Nikon EN-EL 15, Panasonic G6 Battery Plates, you can get, for just a little more, the ikan D7-2 7 3G-SDI/HDMI Field Monitor w/Waveform. Please see attached. Can I use the monitor with atomos power station by dc port? The DC connection that is included with the Atomos Power Station is specifically for the Atomos Shogun. However the DH7 comes with both LP-E6 and NP-F battery plates, the Power Station comes with power adapters for both of those battery types. You should be able to use one of those adapters to power the Ikan monitor. 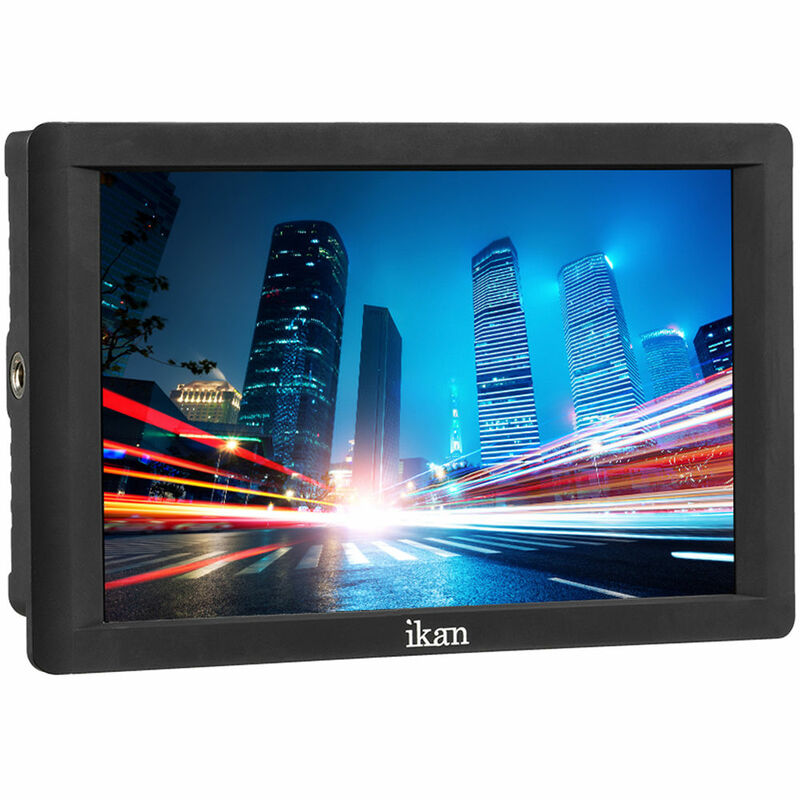 The ikan DH7 7 Full HD HDMI Monitor with 4K Signal Support has Monochrome Peaking. Hi, can this monitor provide overlays for different aspect ratios? I.e. if I wanted it to overlay bars over the image so that I would know what will be left over if I crop to 2:35 aspect ratio later? Thanks. It does have 2:35:1 aspect ratio framing built in, no rubber bands or anything like that. Go to Menu-Video Config-Aspect and then choose 2.35.1 ratio. Answered by: ANA MARIA M.